Roll up, roll up! In this lesson, we're going to learn how to draw a cartoon hedgehog – a small, spiny mammal that's native to Europe, Asia, Africa and New Zealand. So, don't be shy – get your pencils at the ready and follow these simple steps to drawing our prickly friend! 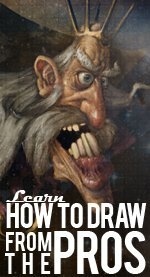 Are you ready to learn how to draw a cartoon hedgehog? This is going to be some prickly fun! Let's get started on our cute critter by drawing a large circle with a smaller, irregular triangle at the bottom. It may not look like much at the moment, but as our drawing uncurls, you'll soon be creating an awesome cartoon hedgehog to add to your portfolio! Now we've got the basics, we can start adding some details to bring our cartoon hedgehog out of her den and into the garden! Taking the large circle we drew for the body as our basis, draw a jagged line all the way round to represent spikes. Then, add two large ears on top of the head by drawing two upside-down 'U' shapes. For the next step in how to draw a cartoon hedgehog, draw two large eyes in the middle of the head, followed by a nose and some whiskers as in our illustration. Finally, just draw a short vertcial line from the bottom of the nose to the jaw. Our cartoon hedgehog is really starting to take shape! Let's now add some more details to our cartoon hedgehog by drawing a jagged line at the top of the head to represent fur, followed by three feet. Despite their small size, hedgehogs are surprisingly good at running, climbing fences and even swimming! Are you enjoying learning how to draw a cartoon hedgehog? Remember to add three claws to each foot as in our illustration – our cute cartoon hedgehog is almost ready to go out foraging for grubs, mushrooms and fruit! In the UK, many people leave food out for the hedgehogs in their garden, such as tinned dog or cat food, nuts and dried fruit. STEP-4: Let's Get Working on Some More Spikes! Our cartoon hedgehog is looking pretty epic by now, but before she can go out into the wild, she's going to need a lot more spikes!This is quite a detailed part of our drawing, but is well worth the extra effort to create an awesome illustration to impress your family and friends. Imagine you're sketching small mountain ranges and sketch in those spikes, remembering to follow the curve of the body as you do so. By the time you've finished, you should be left with an effect simliar to the one in our illustration. Did you know that a hedgehog's spikes are actually hollow hairs filled with keratin? It's the same substance our nails and hair are made of! For the last step in how to draw a cartoon hedgehog, sketch in the inner ears and finish off the feet by drawing some claws on the end of each of our cute critter's toes. She's now ready to go digging in the dirt and find some tasty snacks! STEP-5: Coming out of the Hedgerow with Color! Now that our drawing is finished, let's bring our cartoon hedgehog to life by going crazy with color!First of all, draw around the outline using a dark purple pen and rub out any lines you don't need. To add some depth to those spikes, do some in purple and some in gray, as in our illustration – this makes our cute critter look really 3D. Use this same purple for our hedgehog's whiskers. Next, take a light brown color and fill in the main body – epic! After this, color in the face of our cartoon hedgehog using a lighter shade of brown, then select a darker shade of brown for the inner ears, nose and claws. Remember those large eyes? Let's fill them in using your darkest brown pen, leaving a small area white to represent highlights. Finally, take a red pen and fill in the mouth – our cartoon hedgehog is now ready to roll out of her den and go exploring! We hope you had fun learning how to draw a cartoon hedgehog. Why not draw some grass around her or create some friends for her to play with? See you next time for more awesome artistry!